Daily Illuminator: A GURPS Supplement Worthy Of Glowing Reviews? June 29, 2016: A GURPS Supplement Worthy Of Glowing Reviews? "Nuclear power plant" and "uh-oh" are two phrases you don't generally want near each other . . . unless it's in a modern RPG campaign and you're looking for an awesome plot development! 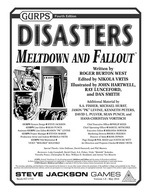 Bring those worst-case scenarios to life with GURPS Disasters: Meltdown and Fallout. This supplement is your guide to modern nuclear reactors (plus some theoretical ones), as well as an in-depth look at radiation in GURPS. Discover what fuels today's reactors, what can go wrong, and how to put it right (or get out of the way). Unleash radioactive threats on unsuspecting heroes . . . or use the included gear and insight to let them contain and avoid it. This volume also examines GURPS traits that normal humans might have in these situations, plus radiation-tied advantages that more unusual entities might exhibit. It provides a plethora of insight into how to use reactors in modern, historial, fantastic, or futuristic campaigns, plus a bibliography for further inspiration. Whether you're looking for an exciting danger to use in a GURPS Action adventure, inspiration to spice up a GURPS Supers setting, or a way to unleash a GURPS After the End campaign, GURPS Disasters: Meltdown and Fallout is your one-stop guide to turning a worst-case scenario into best-possible gaming!